We are all about the DIY wedding flowers at this time of year. Not that we need a special occasion for our paper flowers! We have enjoyed making a vase full of crepe paper calla lilies this week. 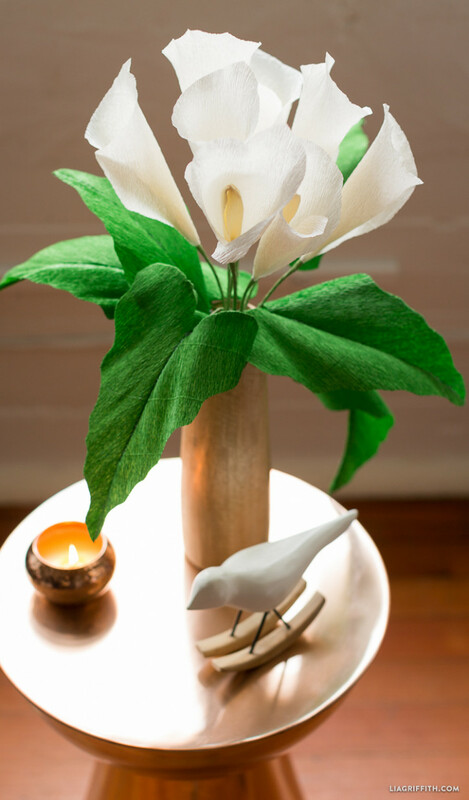 Simple, elegant and perfect for any occasion, our DIY calla lily is one of our most favorite. 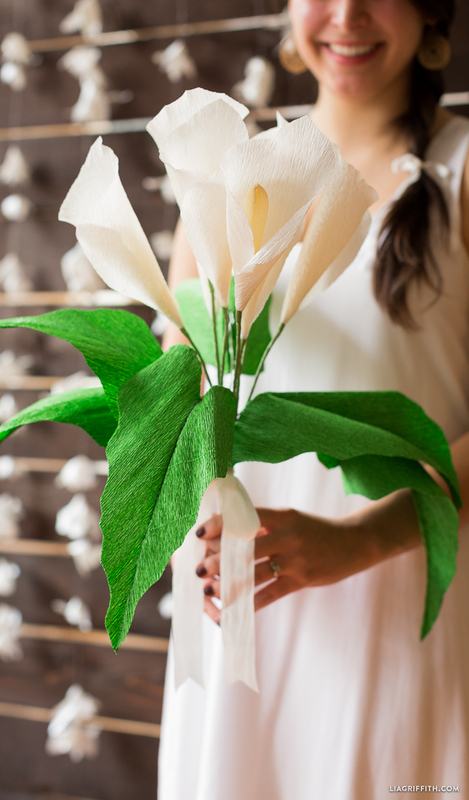 Use a good quality crepe paper in white, green and pale yellow to make your paper flower. Begin by downloading our pattern below then you can follow our simple step-by-step tutorial. Using crepe paper is different. Firstly, your petal shapes must be cut out along the grain of the crepe paper. By doing this you can gently pull the grain apart along the edges of the petal which will give it a natural looking outwards curl – so pretty! Similarly with the leaves, cut the pattern out at a diagonal to the grain. The grain of the paper will then look like the lines of the leaves, giving them a beautifully natural quality. Is there an SVG available for these? Thanks! How long is the stem for each flower. Can’t wait to start. It can be a little tricky at first for sure. 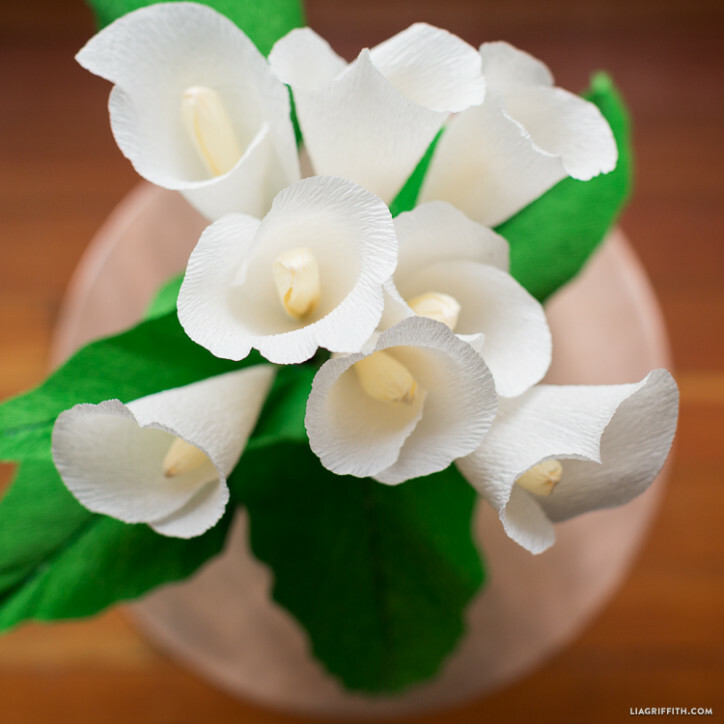 Lia, I’m loving your paper flowers and would love to make them as gifts for my friends this year. I can’t wait until your line is available at Amazon! Until then, can you please recommend where I can purchase crepe paper that I can practice with? I haven’t found a store that sells them in sheets and there are so many online stores that I’m skeptical of where to buy from. Thanks so much for your time! Where can I purchase crepe paper for your floral projects? Do you think this pattern would work with the metallic text weight paper you usually use? I’m not a fan of crepe, but I want to try these out! Thoughts? Unfortunately this template won’t work well with regular paper. Crepe is a stretchier paper, if you wanted to make this with text weight paper, you would need a larger template with a slightly different shape. Sorry about that!! My crepe paper is too thin. What can I do? Here in SA we only can get that thin crepe paper. I think thin crepe paper will be fine! If it ends up being too flimsy and won’t stay upright, I would say that you can try doubling the crepe 🙂 Good luck!! I used 180 gram for this project, but you could also use something lighter and it would work well too! Simplistic, graceful beauty! Thanks for sharing your artistic talent with all of us. I’m having three fresh callas on my dining table – a dark purple red color, which looks beautiful with some branches of red cornus. To hide the naked calla stems I put some short buxus branches into the glass Vase. Beautiful!! And yes, nothing can beat a bouquet of fresh flowers. I actually love mixing paper flowers into bouquets of fresh flowers, it adds a nice element of texture! Thank you ery much, they are beautiful calla lillies. These Calla Lilies are so graceful and quite real looking. How do you do it Lea? Did you take course in paper construction for flowers? Or knowing you and your love of paper flowers it’s a talent you came by naturally. Whichever it was you are so good at it. Love these. Would love to make some some day. Have resolved to give myself time to get this shoulder/arm situation resolved/completed before I embark on any other big projects. Next will be getting my loss of hearing resolved. Has become problem which interferes with my ability to function as well as I can as 75 yr. old woman. So have lots to accomplish for while.